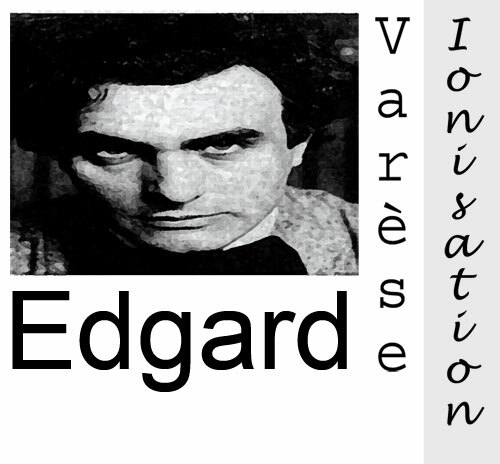 From an early age Edgard Varèse showed an interest in music but his father preferred the idea of Varèse leading a more normal life sending him to school in Paris where he studied mathematics and science in the aims of becoming an engineer. Meeting Roussel and D'Indy however changed Varèse's attention more to music, composing several pieces in both Paris and Berlin. In 1915 Varèse moved to America where he became a citizen, America would also offer Varèse a platform from which to present his music. As a composer Varèse sought new sounds and new ways in which to present these sounds. He was fortunate enough to be in a country that was still finding its musical identity, unlike his native Europe that was still drawn to tradition, with only a handful of composers bold enough to venture into un-chartered territory. It was at this stage in his life that Varèse's early teaching and admirers became an advantage, for it was their knowledge and encouragement that now gave Varèse the courage to bring his ideas to the public. The first of Edgard Varèse's new works to be played was in 1921 when Carlos Salzedo the founder of International Composers Guild played Amériques in its entirety, continuing the performances by introducing the public to Hyperprism (1923), Octandre (1923) and Intégrales (1925). Varèse was very particular in which works were presented. In his earlier years Varèse had wrote compositions for opera and orchestra whilst living in Europe, taking one of these Bourgogne (1908) with him when leaving for America; however as with all of Varèse's early works he subsequently destroyed it. Hyperprism also showed the new methods of Varèse by bringing new instruments to the ageing line up that was the orchestra. Sleigh bells, Indian drums and tam-tam's were but a few of the instruments used in this exciting new line up. The excitement however did not pan on to audience, reports of riots from some members of the audience (something that had not been heard of since Stravinsky's first playing in 1913 of Sacre du Printemps (Rite of Spring) or as the critics called it Massacre du Printemps (Massacre of Spring) a piece that saw opera move into new era), to those that asked for it to be played again. Maybe this was the reason Varèse put so much effort into one of his most remembered pieces Ionisation, wanting the audience and his fellow composers to truly understand his intentions and methods of organised sound. Using a similar line up to the Hyperprism, Varèse also introduced two sirens to the orchestra's arsenal of sound. The piece also took music theory into places that even at times the composer could have only imagined could be the results of his unique scoring. Ionisation attempted to break this pattern of thought by moulding the overall sound with the use of only percussion, producing a whole sound unique to its scoring and unmatchable by any one single instruments timbre alone. Unaware of the implication, Varèse's approach would also give him an upper hand on other composers as electronic musical instruments slowly began to emerge. Varèse's desire to hunt down and use the electronics of his day, may also go some way to explaining why (even though in America) he did not use the Telharmonium (or as Busoni a teacher of Varèse's called it Dynamophone) as it was nothing more than an extension of tonality (something he wished to break away from). Varèse was also an admirer of the Russian radio engineer Léon Théremina and used his instrument the Theremin which was capable of oscillating between tones in a controlled pitch movement, performed by the user. It's therefore a shame that Varèse's collaborations with Léon Théremina were brought to an end when Varèse moved from New York to San Francisco. History has shown that Varèse did try to continue this collaboration upon his return to New York in 1941, however the Theremin designer was no longer in New York. Evidence supporting this was found in a letter meant for Léon Théremina whom unfortunately did not read the letter until 1989 when musicologist Olivia Mattis presented it to him in an interview. Some of these ideas and the use of the sirens may well have come from Varèse's time in the French army during WWI and his interactions with fellow thinkers such as Luigi Russolo and Satie. How was a composer meant to explain the evil sounds of war, when no melody was prepared for this task alone? As Varèse continued in his quest he was taken more and more seriously and found himself pioneering ideas that would all eventually blossom in his finest hour when Philips laboratories asked him to stage their pavilion at the Brussels world fair. Varèse had in is own words waited for this moment all his life, and set about creating a display that would in hindsight be a sign of a genius at work. With over 425 speakers and the new instrument that was the tape recorder (Varèse had previously used this in his 1954 in his piece Déserts which also included percussion and wind instruments) Varèse defused the sound over all the speakers in a specially designed room that concentrated on all aspects of architecture. Coloured lights were also used in this ground breaking display of Poème électronique (1957-8). Varèse now in his late seventies did not retire after this project but continued to write, unfortunately his life was brought to a natural ending before he could complete his work Nocturnal which in respect was finished by a fellow composer and friend Chou Wen-Chung, Chou Wen-Chung's interests in Varèse's work has also enabled him to perform and record to CD all of Varèse's major works for future generations.